NutritionData says that 1 ounce of raw whole almonds, about 23 nuts, provides 162 calories, 117 of those calories (72%) coming from fat. As we’ve seen , that’s not how many calories or how much fat we get when we eat them. (See: We Absorb Fewer Calories When We Eat Whole Foods – The Case Of Almonds). That study found that almonds’ calories are overestimated by up to 32% since our digestion is not 100% effective at releasing nutrients, e.g. fat, from the almonds before they exit our body. Conclusions: Following mastication, most of the almond cells remained intact with lipid encapsulated by cell walls. Thus, most of the lipid in masticated almonds is not immediately bioaccessible and remains unavailable for early stages of digestion. The lipid encapsulation mechanism provides a convincing explanation for why almonds have a low metabolizable energy content and an attenuated impact on postprandial lipemia. This is an electron microscope image of almond cells that, as you can see, remained intact after chewing, making their nutrients unavailable for absorption. Those little white circles in image B are fat droplets. The subjects chewed raw or roasted whole almonds, then spit them out. These were young, healthy subjects whose chewing apparatus was intact. 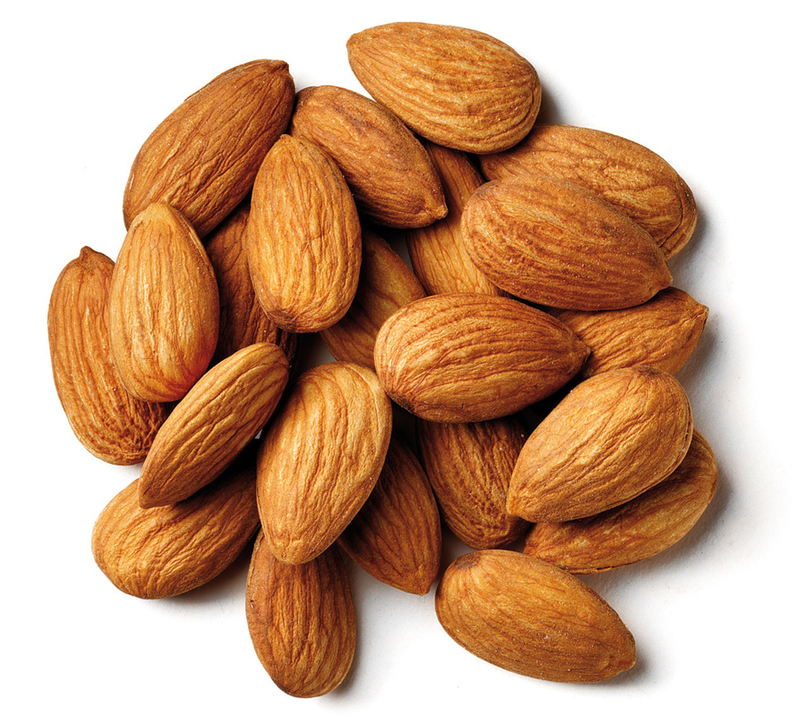 Upon analysis, only 8.5% and 11.3% (raw and roasted) of the fat in the almonds was released by chewing. If a 1 ounce serving of raw almonds has 14 grams of fat, only 1 gram of that fat (8.5%) was liberated for absorption via chewing in this study. You read that right. So, not only do the almonds themselves not provide as many calories and as much fat as we’d expect, but eating them causes us to feel full and eat less, assisting weight loss. In conclusion, we have developed a new method for determining lipid bioaccessibility of masticated almonds, showing that most lipid (∼89–92%) is retained within the tissue matrix (i.e., as intracellular lipid). An encapsulated lipid mechanism provides a plausible explanation of why almonds elicit a low postprandial lipemic response and have a low metabolizable energy content despite their status as a high energy density food. This mechanism may also partly explain the sustained weight loss induced by an almond-enriched diet. Perhaps this is why the men in that pistachio study could add – a pure add, not a substitution – 120 whole pistachios a day to their diets and not gain weight or increase their BMI or waist circumference. Nuts, as we’re coming to learn, especially raw, whole nuts have an undeserved bad reputation among dieters. This entry was posted in Uncategorized on January 12, 2015 by Bix. I love nuts but I limit them so I don’t get too much fat. It seems I may be able to relax my limit just a little. I wonder if the same holds true for chia seeds? After I wrote this I went out and had a handful of almonds. Maybe 10. Small hands. I like almonds but, same as you, I limit them because of the fat. I like walnuts too but they’re a softer nut. I bet we chew them up better and get more fat from them. American Almonds are pasteurized . Their oil is extracted and what is left of it is mere “chaff” for lack of a better world. Almonds have oil and fiber – that is its nutrition – It is meant to be eaten raw and in limiting quantities. When Nature gives its original product seasonally , it is supposed to be eaten . if the almond is processed, pasteurized and extracted of its parts , thats when it becomes fattening . Haven’t we heard Almond oil is healthy ? I did a Google search on almond pasteurization. It is being done to prevent salmonella poisoning from almonds. There were two salmonella outbreaks related to raw California almonds: one in 2001 and another in 2004. In 2007, a federal rule went into effect requiring all California almonds to be pasteurized. There are four methods of pasteurization: steaming, roasting, blanching and PPO (propylene oxide). PPO is a carcinogen. PPO is the method used by most suppliers. Is the cure just as bad as the disease? The rule has its critics because ignores the underlying systemic problems with conventional agriculture that cause food contamination and upset people seeking organic raw almonds. Organic almonds are typically stream pasteurized. Almonds are just another victim of our industrial food environment. Maybe we should all just fast. Thanks for that, RB. I didn’t know about the PPO. Nature knows where what trees to be grown . And it is best for people in that area ? In the transportation of food and storage of food salmonella poisoning takes places ? May be we should not eat almonds because it is not grown in our area locally ? This sounds radical and extreme. Not good for business. It will be an interesting study – if somebody takes this up , My niece ate almonds as a kid , and she did not feel good . She eats other nuts moderately and she does well . May be we in the north east will have to live on apples and meat and something more . Or may be we cannot stay in the north east because of long periods of winter. I have to find out . Eating Locally is a challenge. Eating on time is a challenge. Eating fresh is a challenge. Eating heirloom is a challenge. Raw , organic ones cost a BOMB. Again there are varieties of almonds – I am still learning about it , so cannot write much. But I am told that a certain variety that is grown in Iran is the best – they are small and bitter . it does not have much shelf life either. Even lentils and Legumes are Genetically modified for long life – commericaliztion of food for TRADE. May be that is also the reason for EMERGING diseases of the 20th century. Anbyody who enters into the food market has one bullet point to think of – SHELF LIFE. if there is no shelf life , no product on the shelves . Auto Immune disorder has been increasing steadily every year ? What is the root cause of this ? Food is meant to strengthen our immune system – if it is doing other wise is there something wrong ? Will a cause , effect realationship be established – The industry will be breaking down the doors of the scientist if anybody agrees to take up this study, and may be no funding. there is a solution but it is bad for business, bad for trade, bad for the stock market. Technology has eazed our life, but has it made it difficult in many ways ? I can see both side of the glass – half full and half empty. This is also called politics in food . I am not sure If I answered your question or answered around the question – And sometimes google will not give me the right answers. Unfortunately I have got many of my answers from people who dont write on google . Th You Bix for this forum. I find it very difficult to eat local, especially here in the Northeast in the winter. It’s simply not an option. I’m talking about for the bulk of one’s diet, not a local tomato or apple. This “eat local” movement seems better suited to warmer climates, and to places where it’s easy to grow food, like California. It also seems better suited to people who can afford to live a lifestyle where buying from Farmer’s Markets and local farms and putting in their own time and labor is an option. I eat at least partially local–as local as the backyard–even in winter. It’s amazing what will winter over here–currently I’ve got (outside) collards, kale, arugula, sage, parsley, green onions, mustard greens, Miners’ lettuce, ornamental cabbage (not just pretty but delicious and sweet), pansy flowers, corn salad. Plus tender wild dandelion greens that grow in my yard and bittercress (in its most delicious rosette form), onion grass (wonderful stuff), and chickweed. And b/c it’s winter, you do NOT have to do anything to them–no weeding, no covering to keep insects off, etc. Failing to free the fat in almond cells by chewing doesn’t mean it’s not liberated elsewhere in the digestive system, via enzymes, acid, or physical movement. But it’s still probably not 100% absorbed … is my guess.